Jonathan Lemke thought spending two weeks alone with his partner in a beachside cottage would help to rekindle the lost passion of their 10-year union. He'd chosen Tybee Island, a quiet seaside community on the Georgia coast, east of Historic Savannah. Jonathan had spent his childhood growing up on the pristine shores of the barrier islet, which continues to hold a special place in his heart. The romantic surprise backfires when Paul, Jonathan's partner, rushes off to Chicago. Yes, it's thoroughly engaging, and offers the satisfaction of a romance coupled with the unexpected element of the paranormal. 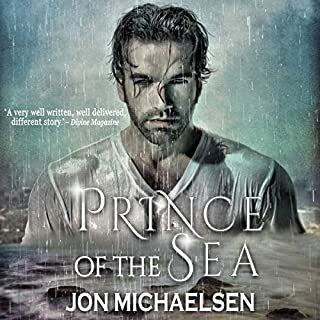 What other book might you compare Prince of the Sea to and why? None, to be honest. I haven't read another book that combines the elements of romance and the paranormal. What does Philip Church bring to the story that you wouldn’t experience if you just read the book? Excellent enunciation and very good characterization. My only critique is that he reads it very quickly, as if he's in a hurry. Does Love Have a Ghost of a Chance? I'd read the book and was excited to hear it - listening and reading are distinctly different pleasures. Michaelsen and narrator Church bring the island to life. I can hear the sea and the cadences of the characters' voices. The love gone bad (spoiler?) is made up for by the magical, mystical romance promised by the mystery man from the sea. And I'll confess: I love a happy ending, or at least a hopeful one. At 63, former jazz musician Wade Lovett finds himself something of a trailer park Lothario carrying on affairs with three different women. But when circumstances prompt Carol Smitzky to make a compelling case for a marriage arrangement, he agrees. The next morning, he visits girlfriend number two, Peggy MacCallister, to tell her the news - and finds her lying dead on her kitchen floor. Where does Death Comes to Happy Acres rank among all the audiobooks you’ve listened to so far? 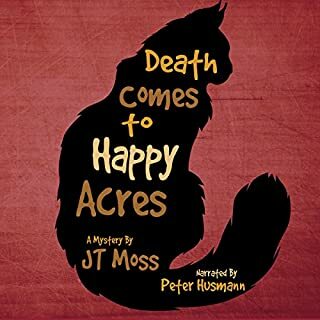 I'm not a big audiobook listener, but 'Death Comes to Happy Acres' has me rethinking that. I'd read the book and delighted in the style, characters and story, and it has been brought to life in near-perfect fashion by narrator Peter Husmann. He has exactly the voice, cadence and delivery I'd expect for this book. It made for the perfect audiobook experience over the long weekend. I can't say it kept me on the edge of my seat - that seems more appropriate for a thriller. This is a delightful mystery that kept me guessing. What does Peter Husmann bring to the story that you wouldn’t experience if you just read the book? Peter Husmann has the delivery and voice I would most connect with this book. The characters were brought to life well and distinctly, and the pacing was just what it should be. I'll be listening to more audiobooks after this one! It's a great introduction (and in my case, a re-introduction) into the unique world of the spoken narrative.